Nothing beats a good night sleep after a long day of fun in sun at the campground. For campers who need the most space to stretch out and catch some Z’s, a king bed is a must. 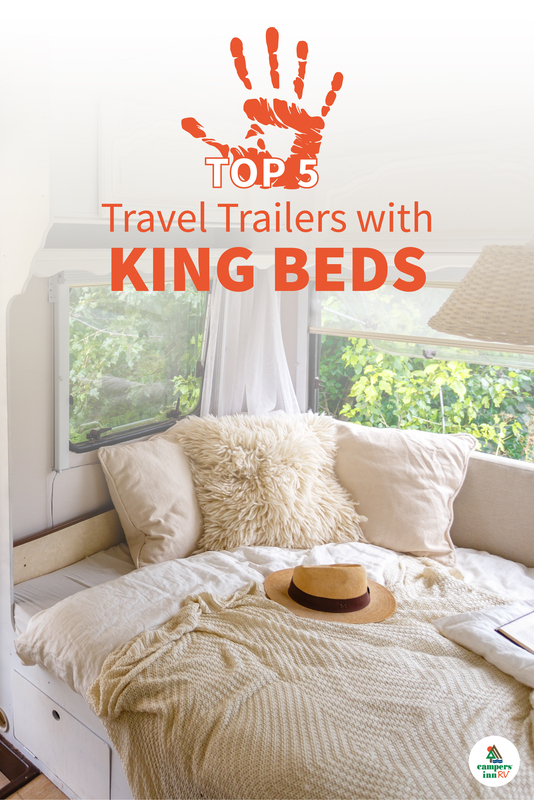 If you are an RVer who loves a sound slumber, check out these 5 incredible floorplans from top brands that feature king beds. 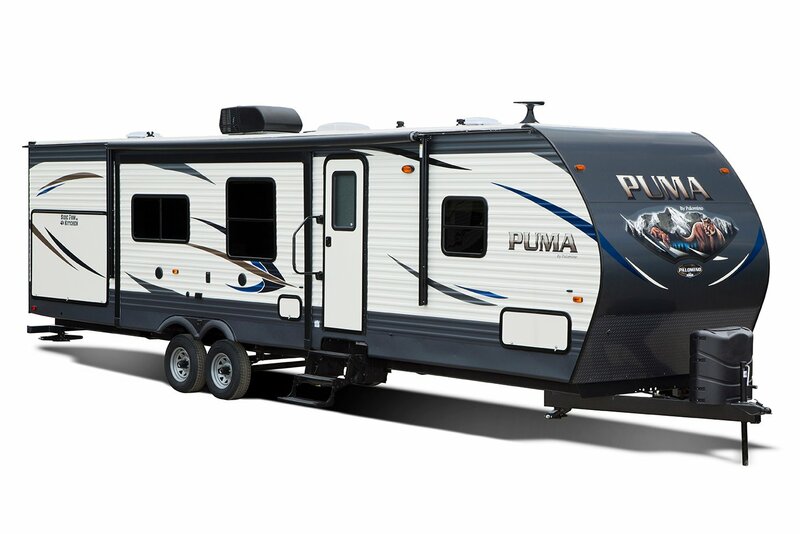 The Palomino Puma is a rugged travel trailer for enjoying outdoor activities in style. The 31-FKRK model features a spacious master bedroom with a king bed slide-out and dual entryways for increased privacy. In the living area, you will find a front-facing kitchen with a large window, so you can gaze out into your beautiful surroundings while you prepare your meals. It also offers a residential-size fridge and plenty of cabinet space to keep you stocked up on food during your trip. The living area also includes a slide-out with two chairs and a dinette, as well as a comfortable sofa. The Jayco White Hawk is a lightweight travel trailer with durable construction and luxury interior appointments. Its Goodyear tires and galvanized steel wheel wells are built to withstand the rigors of the road and keep you safe while you travel. Inside, the RV features residential touches like hardwood cabinets, LED lighting and solid-surface countertops. The master bedroom hosts a slide-out king size bed along with a dresser and electric fireplace for cozy campground nights. The living area includes a slide-out with a sofa and a u-shaped dinette. Opposite the slide, you’ll find a large entertainment center with a fireplace next to a kitchen with a large fridge. 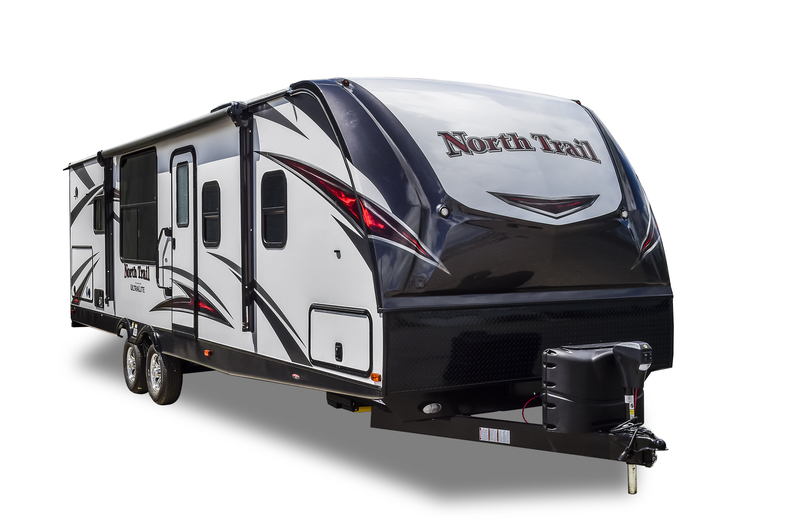 The Heartland North Trail travel trailers are designed with an open living area for easy conversation and memorable trips with your friends and loved ones. The oversized windows let you enjoy your natural surroundings inside and out of your RV. In the master bedroom, the king size bed is paired with a large wardrobe and washer/dryer prep. The living area features two slide-outs to create a spacious room, and it offers ample seating along with a kitchen island and a four-door fridge. 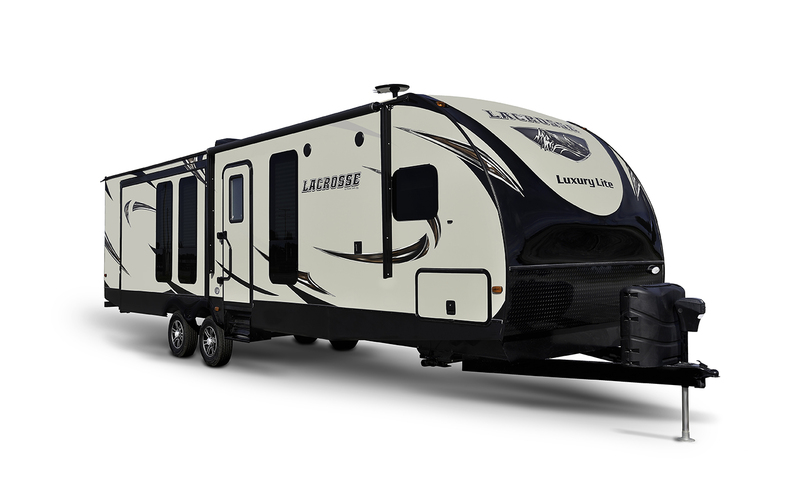 LaCrosse travel trailers are Prime Time’s leading luxury camper brand. The interior is outfitted with fashionable modern appointments like solid surface countertops and hardwood cabinet doors. They are the perfect homes-on-wheels for those who enjoy camping in style. The master suite features a king bed with overhead storage and a full bathroom. The large, dual slide-out living area is enhanced by theatre seating, a hide-a-bed sofa and a free-standing dinette. Its roomy kitchen is complemented by an outdoor grill and refrigerator. 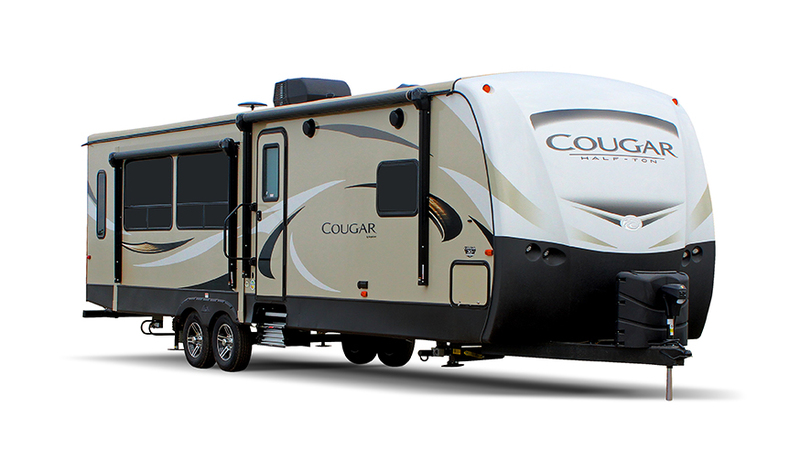 The Keystone Cougar Half-Ton series is a family-friendly travel trailer that is easy to tow and packed with innovative features. 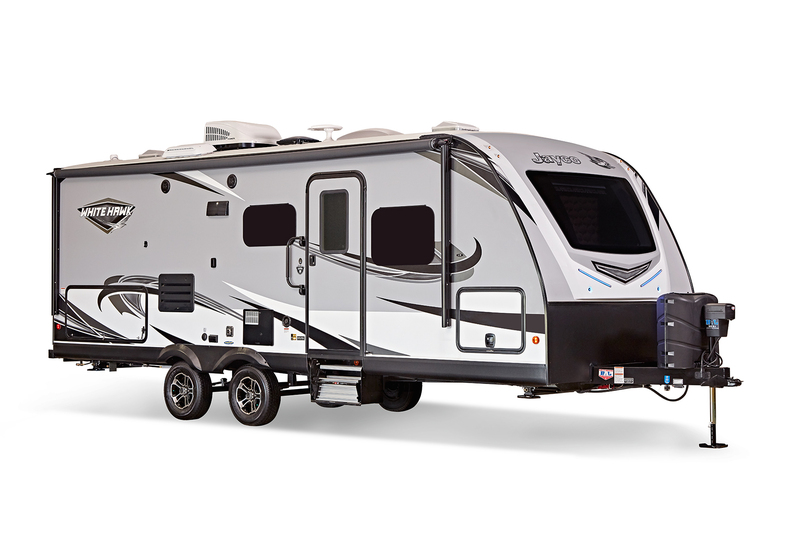 Their Tru-Fit™ slide construction and RoadArmor™ suspension help make these RVs tough, durable and road-worthy. 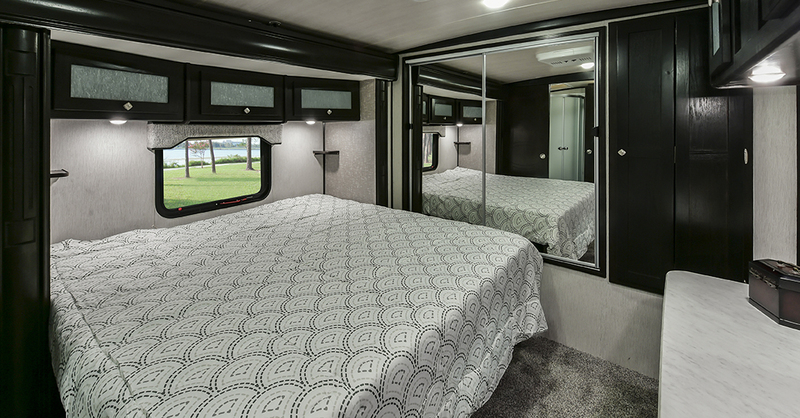 The 29BHS is designed for comfortable family adventures with a king bed and rear double bunks. The living area features a sofa/dinette slide-out and a kitchen with a Furrion® range. It also offers forced-air heat and an enclosed underbelly for extended season camping. 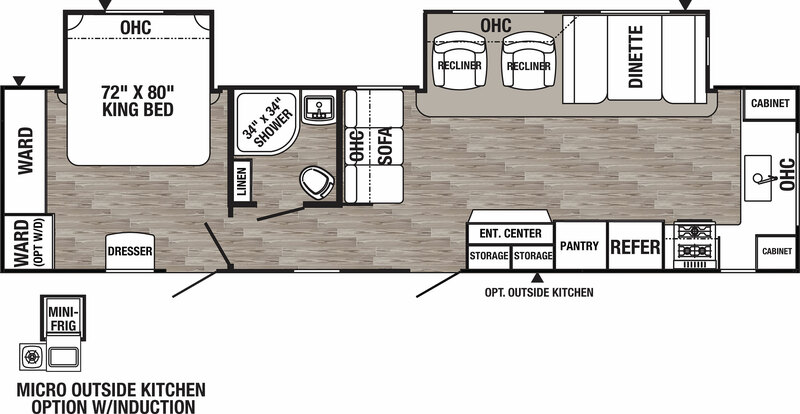 Interested in exploring other floorplan options? 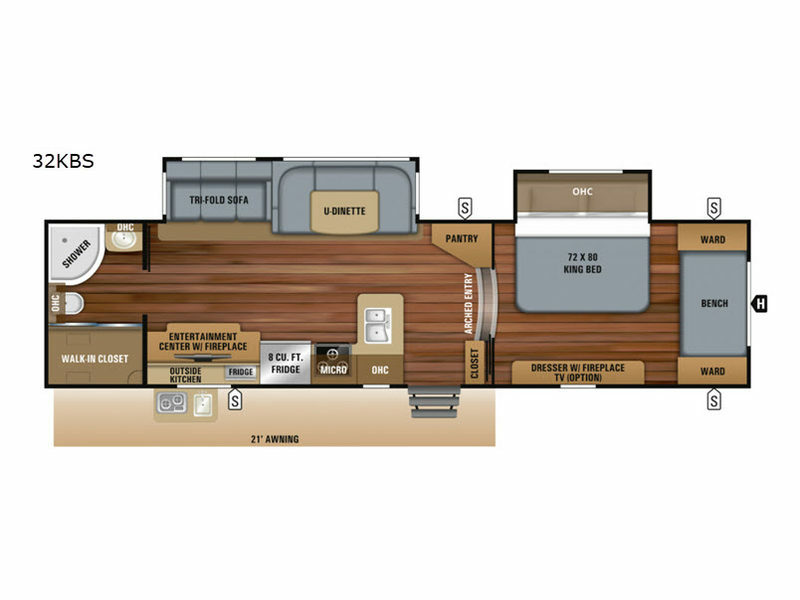 Download our free Travel Trailer Floorplan Guide to find which layouts best suit your lifestyle. *Pictures may vary from actual units.